$10.00 Categorized under: Birdhouse, gourds. 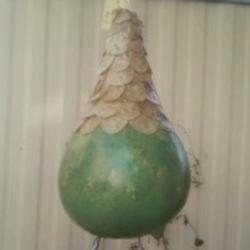 This is Marti's new Birdhouse Gourd. 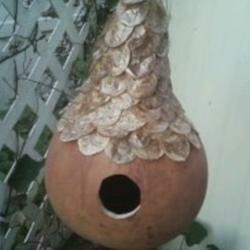 It has a roof made from silver dollar seed pods and has a natural round base for that favorite bird in your garden. 2/6/12 she painted the bowl of the another gourd to show it a different way.